The Fred Haught Trail #141 is part of the Coconino National Forest's Cabin Loop Trail system on Arizona's Mogollon Rim. It was previously known as (and in some places is still signed as) the Fred Haught Trail #22. Once part of a network of trails used by early ranchers and the Forest Service, the route of the historic Fred Haught Trail was marked by blazes (notches) cut into the bark of trees. This description will cover the Fred Haught Trail from General Springs Cabin to its terminus at Pinchot Cabin. The southern half of the Fred Haught Trail shares its route with the Arizona Trail, and is well maintained and easy to follow. The northern half is more primitive, and requires one to keep an eye out for trail junctions, as well as blazes, which consist of two notches deeply cut into the bark of a tree, one on top of the other. Some areas are marked by cairns and small signs indicating "Cabin Loop Trail". 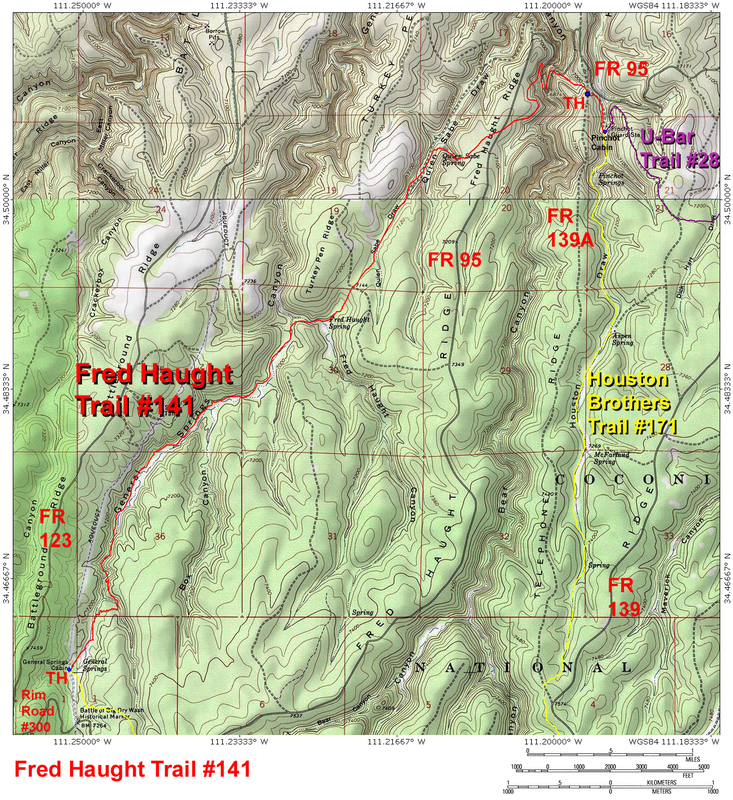 I highly recommend downloading and using gps joe's excellent and highly accurate Fred Haught Trail gps route. Or, at the very least, bring a copy of this topo map. Many of the roads that access this trail are closed during the winter, due to snow. If you are in doubt, check with the Forest Service for road conditions before you go. Forest Road 705, which accesses General Springs Trailhead, can be rough. Those with low clearance vehicles may want to park on the Rim Road (Forest Road #300) and hike 0.5 miles to the trailhead. There are many outstanding campsites along the Fred Haught Trail. Water may be available in General Springs Canyon, at Fred Haught Spring, Quien Sabe Spring, and Pinchot Cabin, but check with the Forest Service for water conditions before planning a trip to the area. Constructed during the 1870's by the U.S. Army, the General Crook Trail connected Camp Verde and Fort Apache. The route passed near General Springs to take advantage of its water supply. General Springs Cabin (constructed circa 1918) and Pinchot Cabin (constructed in the early 1930's) were used as housing for fire crews during the early days of the U.S. Forest Service, and have been preserved for their historic value. Joe adds: Fred Haught was the uncle of Babe Haught. Babe Haught was a bear hunter. Zane Grey hired Babe as a guide. Beginning at General Springs Cabin, the Fred Haught Trail, which shares its route with the Arizona Trail at this point, passes a trail register, and heads north down General Springs Canyon. The Mogollon Rim's coniferous forests soon close in, and the canyon narrows. A half mile in, the trail jogs east and crosses a low sandstone ridge (watch for cairns), before descending to the bottom of fir lined General Springs Canyon. For the next couple of miles, the trail weaves through tall trees along a gradually widening canyon floor, and periodically breaks into ever larger creekside parks. Near the 3 mile point, the route of the Arizona Trail splits off to the west to climb the canyon side, while the Fred Haught Trail stays in the creek bottom. Soon after the trail junction, the Fred Haught Trail turns east to follow Fred Haught Canyon, and arrives at Fred Haught Spring at around mile 3.3. A sign points out an optional side hike to the ruins of Fred Haught Cabin, a half mile or so up canyon to the south. From Fred Haught Spring, the Fred Haught Trail turns northeast and climbs a short ravine up to a broad saddle near the head of Quien Sabe Draw. The trail crosses Forest Road 719 at the saddle, continues northeast, and begins to follow the route of an old road into the depths of fern covered Quien Sabe Draw. At 0.9 miles past the saddle, a side drainage joins from the south, and the Fred Haught Trail begins to parallel along the right (east) side of the road. Look carefully for blazes in this area to stay on route. One mile past the saddle, the trail veers right (east) to ascend a short side canyon, where it climbs past Quien Sabe Spring (34.50466 N, 111.21168 W) and a trail sign. Hint: if you arrive at a large rock pile next to the road in the bottom of Quien Sabe Draw, you've gone about 200 feet past your turn. Now on top of Fred Haught Ridge, the trail turns northeast, makes a signed crossing of Forest Road 95, then drops down to the edge of Bear Canyon. The faint trail contours north along the edge of the canyon for a few hundred yards, before making a brief and rather unexpected turn to the west. Turning north again, the Fred Haught Trail makes a short and steep descent down a grassy hillside, switchbacks once, and arrives at Forest Road 95 again, whose route it will share for the next one third of a mile through Bear Canyon. Bear Canyon is a scenic location, with tall firs and narrow canyon walls of pale Kaibab Limestone. The road/trail crosses Bear Canyon at a hairpin curve, then turns north to exit the canyon. Where Forest Road 95 bends to the east, a little ways past the crossing, the Fred Haught Trail leaves the road on the right (south) side to make an easy climb up a short side drainage. At the top of this drainage, the trail makes a signed crossing of Forest Road 139A. This is the northern access point, also known as the Pinchot Trailhead. To reach Pinchot Cabin, continue east along the Fred Haught Trail, which drops off the east side of Telephone Ridge and follows the route of an old road down to a narrow, scenic meadow in Houston Draw. Pinchot Cabin awaits in the meadow, as does an ideal campsite. The U-Bar and Houston Brothers trails come in from the north and south, respectively, and converge near Pinchot Cabin. At this point, one can continue on the Cabin Loop Trail system, or return the way they came.